Despite recent efforts to stop the oil tycoon Shell from pursuing their drilling plans in the Alaskan Arctic this year, a U.S. appeals court ruled the go-ahead. With over a million signatures delivered to the White House this month by various Environmental groups, pleading Obama to stop Shell’s plans, the oil giant continues to prevail. What will this mean for the Arctic inhabitants? 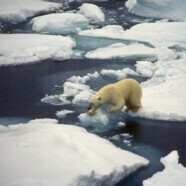 Endangered animals such as polar bears, ice seal species, bowhead whales, eiders, yellow-billed loons, among many more, threatened by global warming, now suffer a double and triple threat; as they are compelled to adapt to the pollution creating, industrial fossil fuel development, and all the possible mishaps that coincide.